So I finally did it. I succumbed to the draw of Colinette. I knew it was going to happen sooner or later. The past few LYS visits have always included fondling of the Colinette. I’m really enjoying knitting this up. And boy is it fast! On 10mm it only took a couple hours to get to the point where I start decreasing. I’m also considering posting the pattern for it when it’s done (assuming I actually like it when it’s done!). Oh, and I had much better luck with Smooch last night. I re-cast on (over 200 stitches!) and the picot edge is measuring up correctly now. 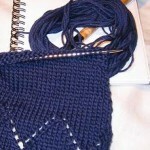 I’ve just started the first row of yo’s, so there’s no real design yet to see other than the edge. I love the way the edge knits up though. I can definitely see using this edge on other designs that need that bit of frill. Smooch looks great! I love it. I wish I wore tank tops. The poncho is very cool. I love Colinette. Yeah Smooch! 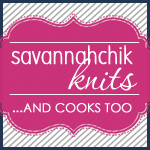 I wore mine today and got the best comment: “I love when you can’t tell that hand knit garments are home made!”. 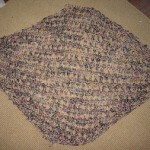 What type of colinette yarn are you using for your poncho? I couldn’t tell from the picture, is it Enigma, Giotto?